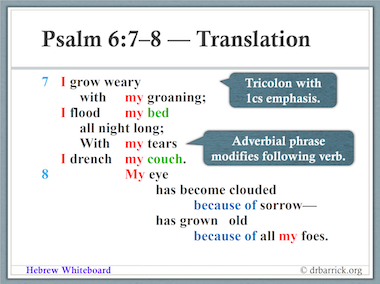 Psalm 6:7-8 (Hebrew verse numbering) describe David’s personal situation in vivid metaphors. As a result of his sin and his illness he has grown exhausted, reduced to weeping, and obviously severely depressed. This stanza of the psalm displays an opening tricolor, assonance, emphatic word order, repetition, and metaphor–all skillfully woven together to present what might be the climactic moment in the poem. Click on Hebrew Whiteboard to download Psalm 6:1-8 or any of the previous studies of Psalms 1-5 and 120-122.